REDUCED AND SELLER IS MOTIVATED! Seller is giving buyer $5,000.00 cash at closing for updates. This beautiful well maintained home with 12 acres is located close to St. Croix. Private park like setting is balanced with lawn and timber, plus a large new storage building. For the outdoor enthusiast there are terrific patio spaces surrounding this home to just sit out and take in the nature that surrounds this property. Home has 3 bedrooms, 3 baths, and large sized living- dining room with a scenic wooded view plus walkout access to a spacious frontal decking, a full finished walk out basement. This great home has 1 bedroom with a bath on the upper level, and on the main level 2 bedrooms and 1 bath. The well done kitchen is located for easy access to the attached 2 car garage. There are also 2 stone fireplaces, one in the living room and one in the finished basement. 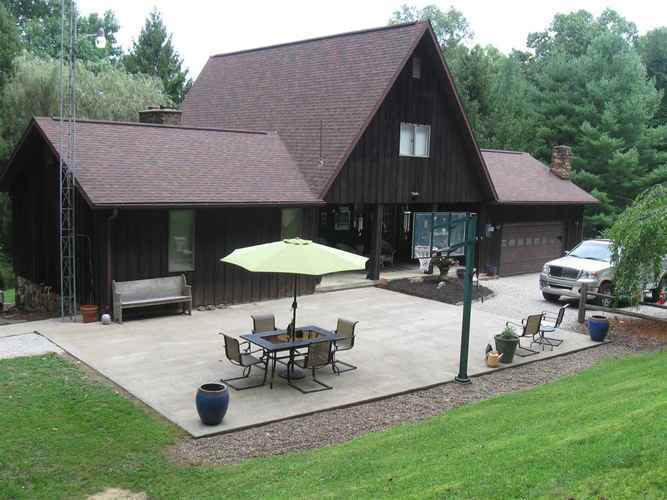 This home is gas heated and serviced by Patoka water. Home and 12 acres are located on Indiana HWY 62 and near Interstate HWY 64 with easy access to all locations in Southern Indiana. Directions:Travel North on HWY 37 , left turn on Indiana HWY 62, travel approx. 5 miles on HWY 62, left turn on Cottonwood Road, the house will be on the right.